Carrie Clark is watching you. Oh, maybe not literally, but one constant running throughout Between the Bed Sheets & Turpentine is the Seattle songwriter’s keen eye for the telling detail and quirks of human nature. These thirteen originals span a gamut of styles, from classic country (“I’m A Lark,” “Where Are You”) and surging rock (“What Have We Done,” “Down At My Knees”) to mischievous music hall numbers (“The Night Before”) and jazz (“The Stranger”), but all of them showcase her astute powers of observation. As they like to say in Hollywood, all the events in Carrie Clark’s music are based on a true story. Not just curious events, but the gamut of emotions brought to the fore by challenges both large and small, and how our voices, faces and body language reflect different sentiments. Clark finds people endlessly fascinating, and all her songs dwell on human foibles. She knows the best places to eavesdrop on inspiring anecdotes, too. “I love dive bars in the winter,” she adds. On the surface, many of these originals may seem primarily concerned with having fun and doling out generous doses of sassiness, yet they reveal myriad layers upon closer inspection. The album’s title, Between the Bed Sheets & Turpentine, is a line from one of the more lighthearted selections (“The Night Before”), but it neatly summarizes the emotional scope of the disc, which encompasses not only all the feelings that can crop up in the bedroom—passion, loneliness, dreams—but also the sometimes hard work of cleaning up after life’s mishaps. The follow-up to 2006’s Seems So Civilized, Between the Bed Sheets & Turpentine boasts the fullest sound and most fully realized arrangements in her catalog yet. Much of the credit, she demurs, goes to her band, the Lonesome Lovers; multi-instrumentalist and arranger Greg Fulton (“my right arm”) has been with Clark since 2003, and the other members of the quintet, Kohen Burrill (Tubaluba), Kevin Emerson (Central Services), Dave Pascal (Love Markets) and Rob Witmer (Love Markets), all boast tenures of two years or longer. 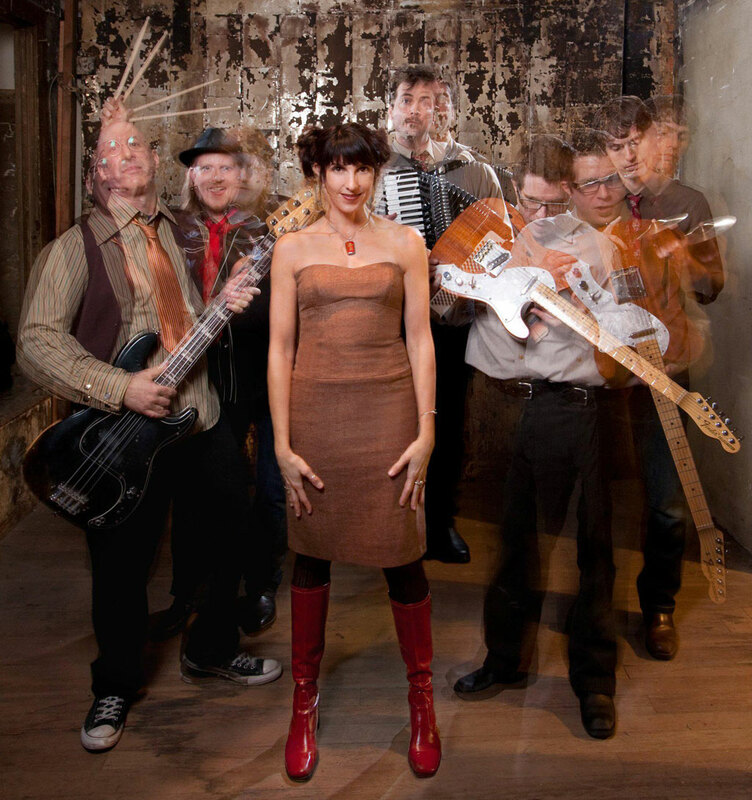 She also underscores the pivotal role played by producer Martin Feveyer (Blue Scholars, Zoe Muth and the Lost High Rollers, Jesse Sykes and the Sweet Hereafter) in helping make her fourth independently released record the finest in her canon yet, pushing Clark and all her musicians to the utmost. The producer also encouraged them to experiment and tease out the unique character within each song, taking full advantage of the ensemble’s versatile musicianship. A few of them changed quite drastically, and Clark cites “What Have We Done”—a state-of-the-world meditation inspired by her toddler nephew—as an especially successful example. “I’m really proud of this record,” she concludes. “I’ve grown a lot since the last one, and I’m excited to share this music.” Carrie Clark is watching you; you’d be wise to keep your eyes—and ears—on Carrie Clark and the Lonesome Lovers, too.